West Barn Cottage was built in 2009 and is located within the village of Shipton Oliffe, with lovely views of the surrounding countryside. It overlooks open fields and the historic, 800 year old St. Mary's Church. West Barn Cottage is the perfect place to relax, unwind and explore the stunning Cotswolds area and its picturesque market towns. The cottage is ideally located for touring the area with Cheltenham, Gloucester and Cirencester nearby. The beautiful Cotswold villages of Chipping Campden, Broadway, Winchcombe, Stow-on-the-Wold, Bourton-on-the-Water, BIbury, Burford and Northleach are all close by. The cottage is easily accessed by car from the A40 or A436, which are two of the main roads through the North Cotswolds. Shipton Oliffe is situated 5 miles east of Cheltenham just off the A40. The cottage sleeps up to 6 people in two bedrooms, with a sofa-bed in the sitting room. There is a private patio area with table and 6 chairs and a rear patio overlooking the beautiful Church with a small table and chairs. There is a gas-fired bar-b-que and a fire pit on the patio. There is ample off-road parking, next to the cottage for 2/3 cars. Planning conditions required the cottage to resemble a traditional Cotswold barn externally but internally it is modern and contemporary in every way with full double-glazing throughout and exceptional levels of insulation. The cottage has ultra high-speed broadband and Wi-fi, excellent mobile phone reception with 3 flat-screen TVs (one being a 40&rdquo; smart TV) with a DVD player and Bluetooth stereo system as well. The cottage is heated by gas-fired central heating, with underfloor heating throughout downstairs and radiators in the bedrooms and bathrooms. The sitting room has an electric, wood-burning stove which creates a lovely ambience without the hassle and aggravation of a traditional wood-burner. Security deposits are not required but guests are liable for any damage caused or additional cleaning required as a result of their actions. The maximum occupancy of the cottage is 6 adults including children but up to 2 infant children (under 18 months) in cots are welcome in addition. Unauthorised over-occupancy is a breach of our Terms and Conditions and may result in the cancellation of your booking and additional charges. Up to 2 dogs are accepted at a cost of &pound;25 per dog. Guests must let us know that they are bringing their dog(s) at the time of booking. Arrival time is after 4pm and departure time strictly is by 11am. Whilst the owners will normally be available to meet and greet and welcome you, there may be times when access to the cottage is via a key-safe on the patio. En-suite (1st floor): Large, walk-in shower, toilet and wash basin. All electricity and gas is included in the rental price. The property has super-fast, free Wi-fi, excellent mobile reception, a flat-screen 40&rdquo; smart TV and separate DVD player with two other flat-screen TVs. It also has a Bluetooth music system. There is free, designated, off-road parking available next to the cottage for 2/3 cars. Before every guest arrival the cottage is deep-cleaned and beds made up. A travel cot (without duvet or linen), highchair and nappy bin are available on request. Children are welcome to use the garden but must be supervised at all times. A small quantity of initial consumables is provided (tea, coffee, sugar, milk, hot chocolate powder, coffee pods, dishwasher tablets, washing up liquid, hand wash, washing powder, toilet rolls, cling film, foil, salt, pepper, cooking oil). The cottage is accessed from the parking area by 4 steps &ndash; however, access can be obtained without steps from the side of the cottage. The smoke and carbon monoxide detectors operate on a sound-only basis.The smoke and CO detectors operate on a sound only basis and, therefore, those who have serious impairment of hearing may not be able to hear the alarm systems and could be at risk. There is no downstairs toilet and access to the toilets is solely by means of the staircase. Smoking is not permitted throughout the cottage, but smoking is permitted on both patios and in the garden. Buckets are provided for cigarette butts. There is a 9-hole golf course at Shipton Golf Club and four 18 hole courses nearby at Lilleybrook, Cotswold Hills, Cleeve Common and Naunton. Cheltenham, Cirencester and Bourton-on-the-Water have a wealth of leisure facilities. There are several large supermarkets nearby in Bourton on the Water, Cheltenham and Gloucester. There is a 24-hour licensed Londis store less than 1 mile away. Ocado, Waitrose, Tesco and Sainsburys all deliver to the cottage and if you let us know the time slot for delivery before you arrive, we will be happy to put items in the fridge or freezer to await your arrival. There are numerous excellent local pubs which are dog-friendly in the immediate area &ndash; full details are in the information pack in the cottage. Built in 2009 by the present owners, West Barn Cottage was designed to be a spectacular, exceptional, very comfortable and luxurious user-friendly cottage. 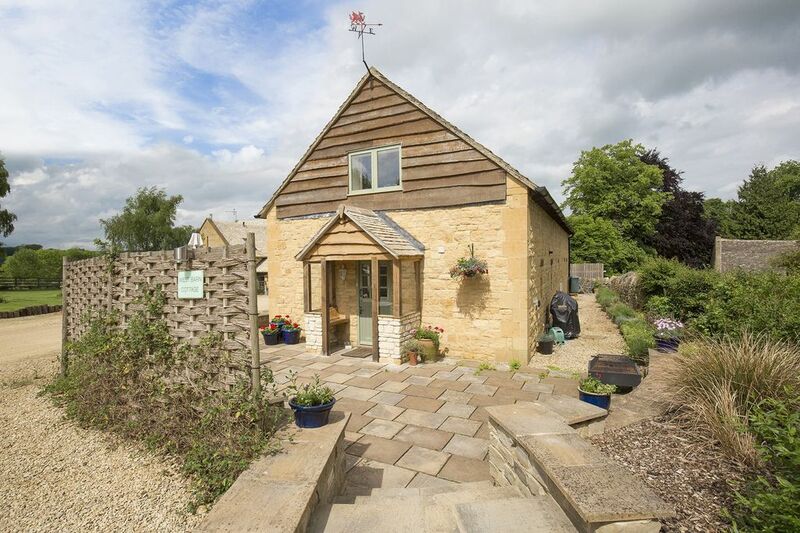 The cottage is very conveniently situated for visiting the Cotswolds with Cheltenham, Cirencester, Stow-on-the-Wold, Bourton-on-the-Water, WInchcombe and many other Cotswold attractions nearby. The whole cottage is exceptionally spacious with a large sitting room and a separate open-plan kitchen/dining and family area. The bedrooms are both very large with an en-suite shower room and separate family bathroom. It has been furnished to the highest standards and is very well equipped with quality appliances. It is no surprise that very many guests have left Reviews and Comments declaring it to be the best cottage they have ever stayed in. The cottage enjoys a high level of repeat bookings. The owners, who live in the neighbouring house, West Barn, will personally welcome you on arrival. They aim to provide you with a memorable holiday experience which exceeds your expectations. We thoroughly enjoyed staying at West Barn. Tim and Binna made us very welcome. The Barn is beautifully furnished and has all amenities. We would highly recommend staying here - it will not disappoint! The cottage is perfectly situated for Cheltenham and Gloucester as well as other pretty Cotswold towns and villages. It is spacious, modern and well furnished. It was perfect for two friends meeting up for a few days. We'll definitely stay there again. I stayed here with some friends whilst on a course in the Cotswolds. It is the 3rd time we have been here this year and we are returning next week, and most likely in 2019 too. We love it here and would most definitely recommend!!!!! Excellent location, great hospitality very friendly. Very accommodating with a dog friendly cottage. Only suggestion would be to have a fully fenced area to allow dog to roam outside off lead. Would definitely be back!! We enjoyed our stay very much. Everything is made to our satisfaction. The only pity is that we have to leave and can not stay longer.